Microsoft appears to be readying the formal launch of a Bing-branded daily deals website powered by white-label group buying platform service provider Tippr, a well-informed source tells me. You don’t have to take my word for it: Microsoft and Tippr are testing the service right now, and the Bing-exclusive daily deals site is hiding in plain sight (see here and here, or check screenshots below). For the record, this offering is notably different from Microsoft’s earlier launch of Bing Deals, which basically features links to aggregated deals from a number of partners, including group buying service providers like Tippr, Groupon, LivingSocial, Zozi and Gilt City but also over 2,000 merchants through Bing Shopping, including Target, Nordstrom, and Zappos. I haven’t found any mention of, link to, official videos or screenshots of the Bing -exclusive daily deals site powered by Tippr. Correct me if I’m wrong, but I’m pretty sure Microsoft has never made any announcements concerning the Bing.com/daily-deals website whatsoever. 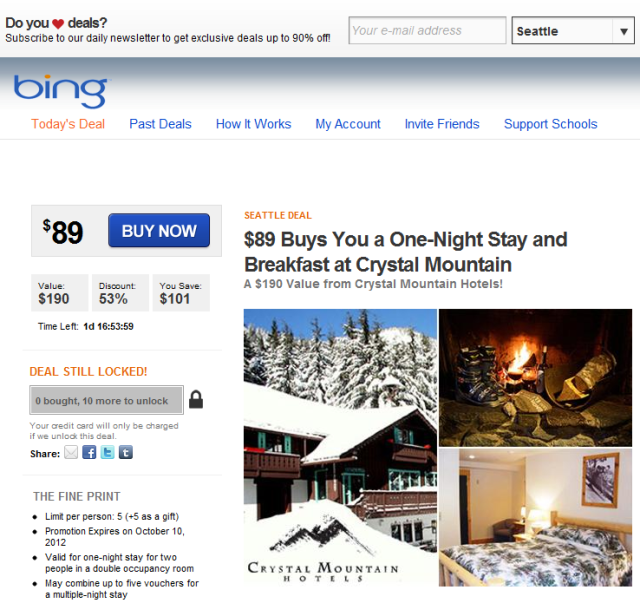 As you can tell from the screenshots embedded below, Bing’s group buying destination site will be familiar to you if you’ve ever visited the likes of Groupon and LivingSocial for deals. 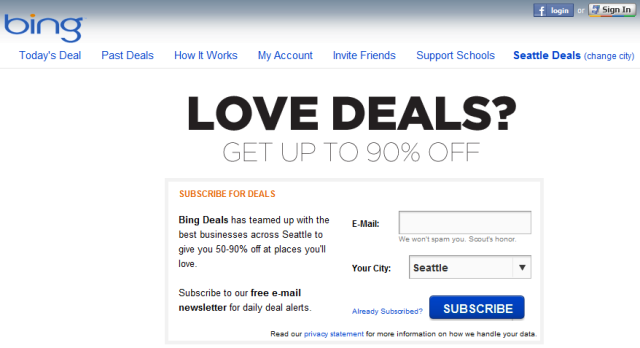 Subscribe to Bing Deals and we’ll e-mail you a new deal every day from a great local business. 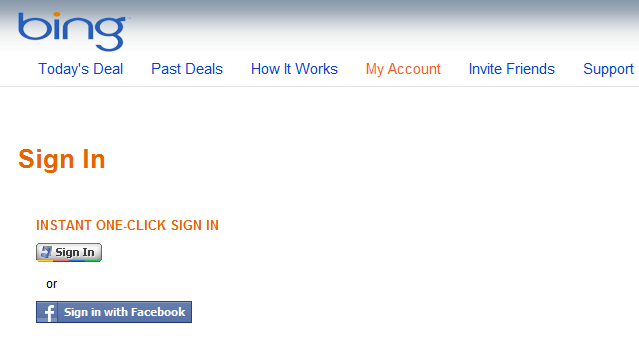 You can also search at Bing.com or browse for deals at Bing.com/daily-deals. Again, this site is the only one I can find on the Web that has ever made any mention of the URL / website Bing.com/daily-deals. What is a sweetened deal? It’s a deal that gets better over time. 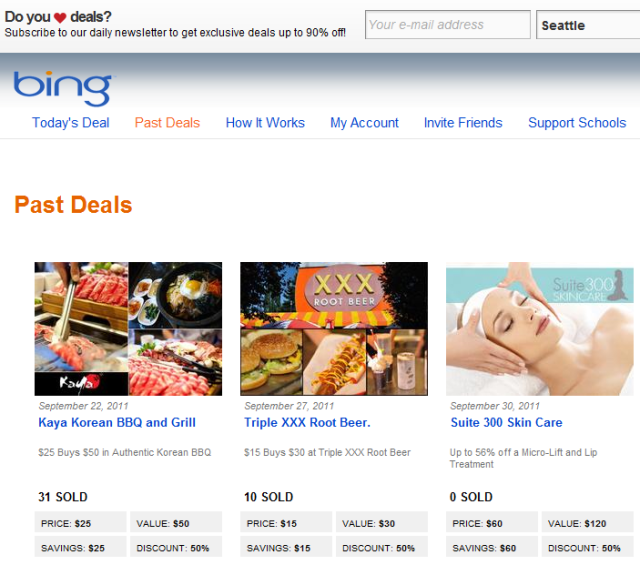 Some of the deals that appear on Bing Deals will get a better value as more deals are purchased. For example, a deal may start off as $10 for $20 at Some Corner Bakery. 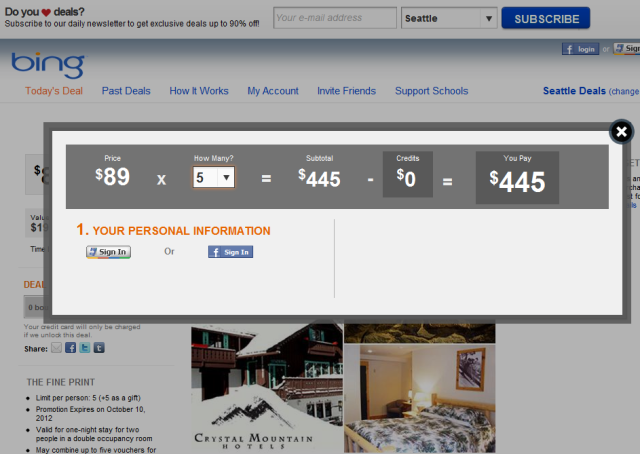 If enough people purchase the voucher, the deal hits the sweeten point and it becomes $10 for $25! No matter what, you will always pay the same amount for the deal you purchase, but what you get for your hard earned dollars goes up! The cool thing about Sweeten Deals is that as more people buy, the value of the deal gets better for everybody who purchased and will purchase the deal. This is why it’s a great idea to share the deal you bought with your friends, so you and everybody else get the biggest bang for your buck. As you can tell from one of the screenshots below, daily deals are / will be available in 12 markets, including Atlanta, Boston, Chicago, San Francisco, New York, Los Angeles and Seattle. When reached, Tippr CEO Martin Tobias declined to comment on the partnership between Microsoft and Tippr. A Microsoft spokesperson tells me he believes this is part of something they’ve talked about before, then referred to as Bing Exclusive Deals for some cities, which are deals you can only get through Bing, but that the team is still “getting it up and running and working out kinks”. It’s also worth noting that Microsoft last week expanded its Bing Business Portal, adding the ability for local businesses to run group deals – rather than regular deals – on Bing (among other things). Search Engine Land offers an excellent run-down of everything that’s new. 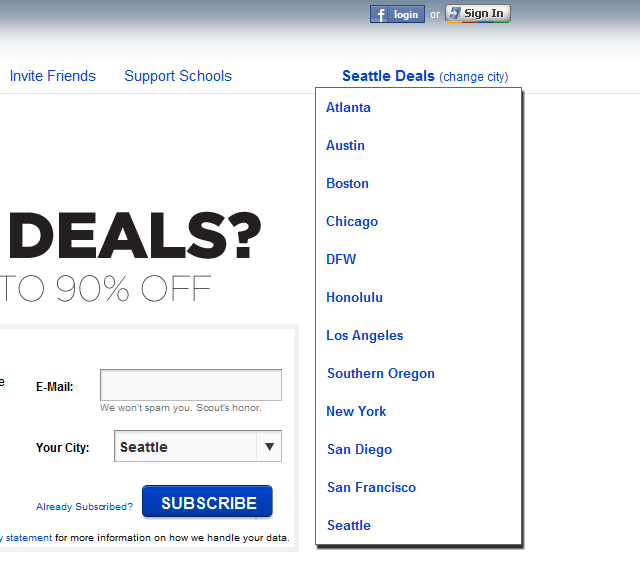 Other daily deal sites in the U.S. include Groupon, LivingSocial, Google Offers, BuyWithMe, AmazonLocal, HomeRun and Dealster, among many, many others.